My family doesn't really go for cucumbers. 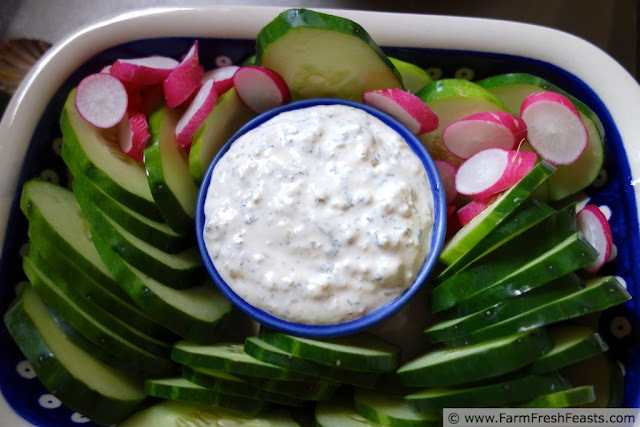 I'll make gyros and use the cucumber to make tzatziki sauce! We'll have Indian food and I'll make raita! We'll have sushi! This past summer I got into pickling. The one common burger topping in our house is pickles. Thanks to Food In Jars, I've discovered how easy and tasty it is to put up a couple of jars of refrigerated kosher dills. I've expanded that to include pickling several other vegetables. But sometimes I need to remember the KISS principle. For other vegetable appetizers, please see my Awesome Veggie Apps and Snacks Pinterest board. For other recipes using cucumbers, please see my Cucumber Recipes Collection, part of the Visual Recipe Index by Ingredient. Want to know how to Use This Blog? Click here. Recently I offered to bring food to a mid-morning gathering. I wasn't sure what I'd bring until I picked up the farm share. When I saw the cucumbers and radishes I knew what I'd make. Sliced veggies and dip. Simple. Always good to have a healthy alternative on the table. After all, other folks aren't as lukewarm about cukes as my family. I decided to try out the bottle of Beau Monde seasoning I picked up on sale (with a coupon!) at Kroger a while back. I think Beau Monde dip was to the 70s what Buffalo Chicken dip is today--ubiquitous. And I love 'em both. In fact, I found this dip so tasty I used it as the bread spread on a cucumber, radish, and salad mix hoagie, and used up the last of it on a BLT. Stir all ingredients together in a bowl. Cover and chill for at least 30 minutes to let the flavors meld. Keeps a few days. This post is linked up with What's In The Box and Food on Friday.